Who knew that out of 740 jobs, washing dishes ranked 735th in terms of desirability, edging out only envelope stuffer, prostitute, drug dealer, fortune teller and beggar. 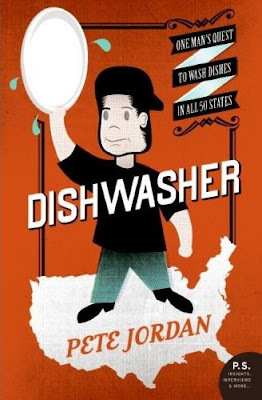 I love the feel and tone of this cover, as it's clear from the NY Times review that "Dishwasher Pete" didn't wash dishes for any other reason than he needed money, there was free food (the "Bus Tub Buffet"), an occasional free drink, and it was no problem quitting when he didn't feel like going to work. No proletarian charm here. The ribbon-y treatment of the subtitle works nicely with the illustration, doesn't it? As opposed to a high efficiency industrial dishwashing machine... hence the retro style cover and notion? if it's Kulick, he's been on a roll lately. I love the feel and tone of this cover.